I wanted to create a blog here that reports on news and concepts relating to both Transhumanism and Transcendence. In a way they are close cousins of each other. They both hold strongly to the view that Humanity will change either through adaption or by evolving. They both believe that future humans will be capable of much greater feats, and greater powers and abilities than they now possess. If you find yourself falling in only one camp of Transformation through Transhumanism, or through Transcendence, please still take time to read some other articles that relate to the views of the other camp. An understanding of both concepts is beneficial for wisdom. There will also be articles and stories that relate to some subjects that do not come under the banner of Transhumanism or Transcendence. These will often be on dystopian subjects relating to the control that comes with an increasing technetronic society. I shall be posting original essays as well as reposts of other blog articles that are relevant. Please feel free to comment, or to notify me of any relevant articles that I should post here. The subject of Transhumanism and Transcendence is pursued throughout a novel which I have just self published called ‘Beyond the Pale’. I wrote with the succinct idea of making these conflicting views the background to the story. They are an ever present running theme but they do not dominate the plot which is fast paced and event driven. I am very interested in this dichotomy of views which I personally believe will soon enough hijack the potency and vehemence of the religious & atheist debates that rage across the world presently. However, I didn’t want to force the idea down people’s throats, thus I placed these arguments subtly as the backdrop to the story. Currently it is available only as an eBook on Amazon Kindle, and there are links to it, and a description of the story on this blog. (Beyond the pale –dawn of the transhuman). It is not expensive and I hope that you might read and enjoy it, and perhaps even give me a reader’s review on Amazon. It is my first novel and I would greatly appreciate your support. 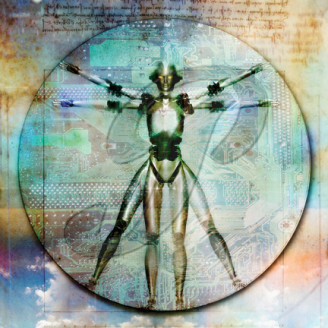 National Intelligence Council study on a Transhumanist future.